Eunice Kathleen Waymon (21 February 1933 ? 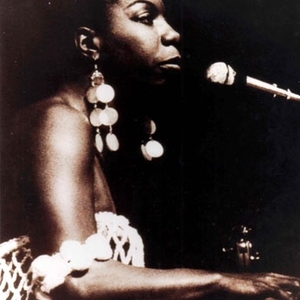 21 April 2003), better known by her stage name Nina Simone, was an American singer-songwriter, pianist, arranger, and civil rights activist widely associated with jazz music. Simone aspired to become a classical pianist while working in a broad range of styles including classical, jazz, blues, soul, folk, rnb, gospel, and pop. Simone was born Eunice Kathleen Waymon on 21st February 1933 in Tryon, North Carolina, USA, one of eight children. Like a number of other black singers in the U.
Simone was born Eunice Kathleen Waymon on 21st February 1933 in Tryon, North Carolina, USA, one of eight children. Like a number of other black singers in the U.S., she was inspired as a child by Marian Anderson, and began singing at her local church, also showing great talent as a pianist. Her public debut, a piano recital, was made at the age of ten. Her parents, who had taken seats in the front row, were forced to move to the back of the hall to make way for white audience members. This incident contributed to her later involvement in the civil rights movement. Simone's mother, Mary Kate Waymon (who lived into her late nineties) was a strict Methodist minister; her father, John Divine Waymon, was a handyman and sometime barber who suffered bouts of ill-health. Mrs Waymon worked as a maid, and her employer, hearing of Nina's talent, provided funds for piano lessons for the little girl. Subsequently, a local fund was set up to assist in Eunice's continued education. At seventeen, Simone moved to Philadelphia, Pennsylvania, where she taught piano and accompanied singers. She was able to begin studying piano at New York City's prestigious Juilliard School of Music but lack of funds meant that she was unable to fulfill her dream of becoming America's first Black classical pianist. She later had an interview to study piano at the Curtis Institute, but was rejected. Simone believed this rejection, which fueled her hatred of racism, was because she was black. Simone turned to blues and jazz after getting her start at the Midtown Bar & Grill on Pacific Avenue in Atlantic City, taking the name Nina Simone in 1954; "Nina" was her boyfriend's nickname for her, and "Simone" was after the French actress Simone Signoret. She first came to public notice in 1959 with her wrenching rendition of George Gershwin's "I Loves You Porgy" (from Porgy and Bess), her only Top-Forty hit in the United States. This was soon followed by the single "My Baby Just Cares for Me" (this was also a hit in the 1980s in the United Kingdom when used for television advertisements for Chanel No 5 perfume). Throughout the 1960s, Simone was involved in the civil rights movement and recorded a number of political songs, including "To Be Young, Gifted And Black" (later covered by Aretha Franklin and Donny Hathaway), "Backlash Blues", "Mississippi Goddam" (a response to the murder of Medgar Evers and the bombing of a church in Birmingham, Alabama killing four black children), "I Wish I Knew How It Would Feel To Be Free", and Kurt Weill's "Pirate Jenny", from The Threepenny Opera, re-cast in a southern town. In 1961, Simone recorded a version of the traditional song "House of the Rising Sun", which was then covered by folk-blues artist, Dave Van Ronk, and later recorded by Bob Dylan, where it was picked up by The Animals and became their signature hit. Other songs she is famous for include "I Put a Spell on You" (originally by Screamin' Jay Hawkins), The Beatles' "Here Comes The Sun", "Four Women", Bob Dylan's "I Shall Be Released", the Bee Gees' "To Love Somebody", and "Ain't Got No (I Got Life)". The latter, from the musical Hair, was her debut in the UK charts, reaching number two in 1968, and a remixed version of the recording by Groovefinder was a UK Top Thirty hit in 2006. Broadway musicals also supplied several hits for Simone: "My Baby Just Cares for Me", "Love Me Or Leave Me", "Feeling Good", and "Ne Me Quitte Pas". Also "You Can Have Him" on the LP Live at Town Hall recorded when she was twenty-six years old; at the end of this operatic performance, which displays her great skill as an actress as well as a musician, she whoops with joy. This single recording encapsulates her extraordinary power, wit, flexibility, sensuality and occasional menace. In 1987 Nina experienced a resurgence in popularity when "My Baby Just Cares for Me", a track from her first Bethlehem Records album (1958) became a huge hit in the UK and elsewhere. Nina's versatility as an artist was evident in all her music, which often had a folk-music simplicity. In a single concert, she moved easily from gospel-inspired tunes to blues and jazz and, in numbers like "For All We Know", to numbers infused with European classical stylings, and counterpoint fugues. Throughout most of her career she was accompanied by percussionist Leopoldo Flemming and guitarist and musical director Al Shackman. In 1971, Simone left the United States following disagreements with her agents, record labels, and the tax authorities, citing racism as the reason. She returned in 1978 and was arrested for tax evasion (she had withheld several years of income tax as a protest against the Vietnam War). She lived in various countries in the Caribbean, Africa, and Europe, continuing to perform into her 60s. In the 1980s, she performed regularly at Ronnie Scott's jazz club in London. In 1995, Simone reportedly shot and wounded her neighbour's son with an air pistol after his laughing disturbed her concentration. She had a reputation in the music industry for being volatile and sometimes difficult to deal with, a characterization with which Simone strenuously took issue. Though her onstage style could be somewhat haughty and aloof, in later years, Simone particularly seemed to enjoy engaging her adoring audiences by recounting sometimes humorous anecdotes related to her career and music and soliciting requests. Simone's regal bearing and commanding stage presence earned her the title the "High Priestess of Soul." In 1993, she settled near Aix-en-Provence in the south of France. She had been ill with cancer for several years before she died on 21st April 2003 in her sleep at her home in Carry-le-Rouet.